Having reviewed of our progress over the last year, I can report that we have again managed to increase the number of companies that we have assisted by 25% from last year. We have continued to specialise in helping customers find business finance in difficult situations, unable to find the business finance that they need. Often they have been declined by lenders. Our help has included includes overcoming a variety of difficult problems such as funding prime debtors, assisting recruiters with RPO debtor funding restrictions, and handling difficult contractual terms, that most funders are unable to assist with. We have added a number of new invoice finance companies to our panel this year, in order to offer a wider choice to our customers. Finding cost savings for clients is an important part of the service we offer. Research this year has shown that we can help find business finance in 97% of cases. The average cost saving found for customers has been 34% of the total invoice finance fees quoted elsewhere. We have published a summary of our Invoice Finance Pricing Research. We set a new record for turnaround this year of just 7 hours between enquiry and release of funding to a client. Many of the customers that we help are in difficult situations that require an innovative approach. Below are just a few examples of recent deals where we were able to use our extensive contacts and knowledge of the market to benefit our customers. The first was a customer that was seeking invoice finance and trade finance for a business being set up between two friends. One of the friends had been involved with a previous business that was undergoing court proceedings. This would be a problem for many lenders – particularly as the new business had not yet traded. We managed to find them a substantial facility so they could launch their venture. The second example was a company that had traded with a large prime debtor, on a sale or return basis, for several years. Numerous lenders had declined the prospect, but we found them a lender that would take a view based on their track record over the preceding years. Another example demonstrates how we helped a business that had completely misunderstood how to compare quotes. They were comparing products all based on just the discount charge. We identified that discount only accounted a small percentage of the anticipated charges so found them a provider that would save them about a substantial amount on their service charge fees (the lion’s share of their invoice finance charges), delivering a huge saving worth tens of thousands to them. These are just a few examples of how we can help anyone looking to raise funding for a company. 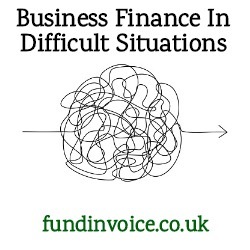 For support please call Sean on 03330 113622 for help finding the business finance you need.